In eukaryotes, mitosis is tightly regulated to avoid the generation of numerical chromosome aberrations, or aneuploidies. 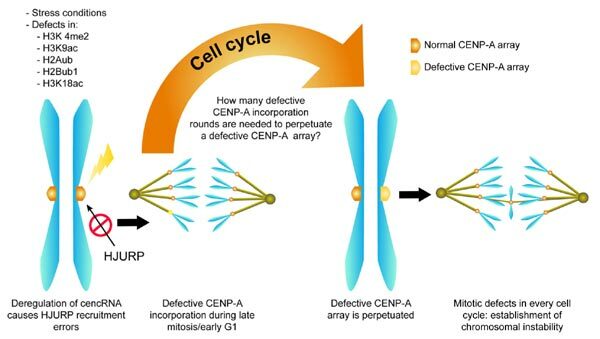 The aneuploid phenotype is a consequence of chromosomal instability (CIN), i.e., an enhanced rate of chromosome segregation errors, which is frequently found in cancer cells and is associated with tumor aggressiveness and increased tumor cell survival potential. To avoid the generation of aneuploidies, cells rely on the spindle assembly checkpoint (SAC), a widely conserved mechanism that protects the genome against this type of error. This signaling pathway stops mitotic progression before anaphase until all chromosomes are correctly attached to spindle microtubules. However, impairment of the SAC cannot account for the establishment of CIN because cells bearing this phenotype have a functional SAC. Hence, in cells with CIN, anaphase is not triggered until all chromosomes are correctly attached to spindle microtubules and congressed at the metaphase plate. Thus, an interesting question arises: What mechanisms actually mediate CIN in cancer cells? Recent research has shown that some pathways involved in chromosome segregation are closely associated to centromere-encoded non-coding RNA (cencRNA) and that these RNAs are deregulated in abnormal conditions, such as cancer. These mechanisms may provide new explanations for chromosome segregation errors. The present review discusses some of these findings and proposes novel mechanisms for the establishment of CIN based on regulation by cencRNA. Chomosome segregation, Chromosome instability, Centromere, Non-coding RNA.